The CW has released two new video clips from "Join or Die" Episode 13 of Season 3 of "The 100", including a flashback scene on the Ark. In the first clip, Pike, Jaha, Abby and Kane are found on the Ark. They plan to send 100 prisoners on earth. Pike was amazed with that choice and insists that the Earth is uninhabitable and that such an option would condemn to death the main stakeholders. 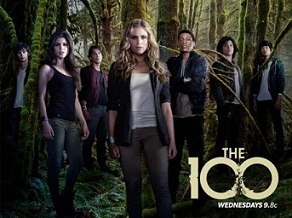 The second clip shows Clarke and his gang go in search of Luna. They cross an obstacle on the road, decide to go down, hear the sound of water and until they fall on a small square that appears on the sketch of Lincoln book. Interviewed by the magazine Enstarz , actor Christopher Larkin - alias Monty - teases the season finale: "The first time I read the script for episode 16, that shocked me. I knew some things that were coming before reading so I was somewhat prepared, but all I knew was devastating. And not just for my character, it's horrible for everyone. " With the ALIE who took control of Polis, the room for maneuver will be very small for Clarke and his friends. As for Kane, he will play to find a solution if Jaha is not too hard on him. The 100 - episode 13 of season 3 will premier on April 28.